Hulk and Thor finally settle their differences through battle as brand-new concept art included in the home release of Doctor Strange shows the two Avengers locked in gladiator combat — it’s an epic duel that Marvel’s been teasing ever since they first announced Hulk would be joining the upcoming Thor: Ragnarok. The film is delivering on director Taika Waititi’s promise that it will be incorporating the popular “Planet Hulk” storyline from the comics as part of the third Thor movie. According to the official synopsis of Thor: Ragnarok, Norse Goddess of Death, Hela (Cate Blanchett), initiates Ragnarok — the apocalypse from Nordic myth — upon Thor’s planet of Asgard. Unfortunately for the Asgardians, Thor is incapacitated, having lost his hammer. He’s forced to fight the Hulk in an adaptation of the “Planet Hulk” comic book storyline where the Hulk was stranded on a distant planet and forced to fight for his freedom. While Thor wasn’t present in the original “Planet Hulk,” the film has found a way to integrate him into the brutal action, creating what’s shaping up to be an intergalactic round two of Captain America: Civil War. The film promises to catch up with the two Avengers who were glaringly absent in 2016’s Civil War battle royale, though it’s still unclear how the gladiator storyline will fit into the complete Ragnarok film. This is considering Thor: Ragnarok has also been described at various times as a buddy road movie in space, and will see several Marvel characters return, including Loki (Tom Hiddleston) and Doctor Strange (Benedict Cumberbatch), alongside new characters like Valkyrie (Tessa Thompson). The film will take place across Earth, Asgard, and the battle planet where Hulk and Thor fight in the first place. 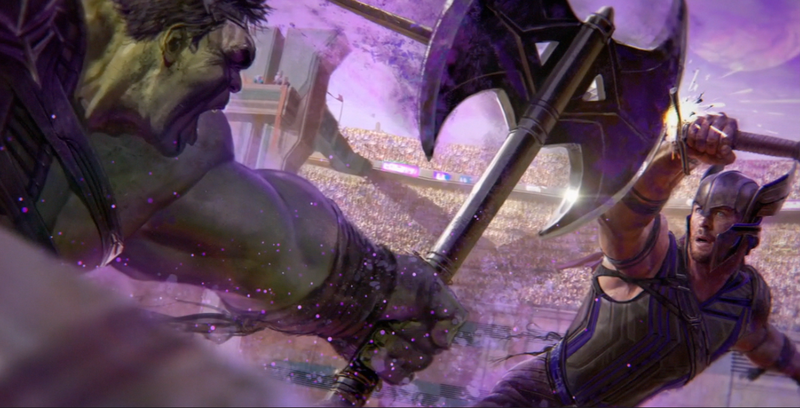 The concept art gives fans the best look at what the Thor and Hulk fight scene will be like in the final film. The matchup also feels perfect considering the two heroes have fought previously in the very first Avengers film back in 2012. Although that fight resolved relatively peacefully, the concept art for the rematch in the upcoming Thor film indicates that this encounter might be more brutal than their previous scuffle.